Et tu, Brutus? Learn about the most gory aspect of Roman Society - the gladiatorial games at the Coliseum. This 300-piece puzzle vividly illustrates a game; the fact leaflet that comes with it gives you the details behind the picture. 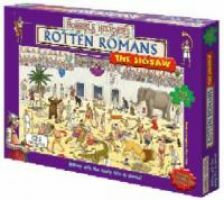 Then take the Ruthless Romans quiz - and see if you can stump your teacher! Also includes an info leaflet and a crazy quiz!